Blurb Description: The Mughal Viceroy of Bengal in 1685, Lord Shayista Khan, was an indomitable warrior who knew no fear. Under is governance Bengal has become the centre of commerce and culture, a veritable treasure chest for greedy enemies: Maratha Warriors, Arakan Rajas, Hindu Zamindars and even the East India Company. Among all this opulence, there is only one possession that Shayista holds dear: a dark diamond knows as the Kalinoor. Kalinoor is cursed however, and Shayista is fated to suffer the torments it brings - including, perhaps, the ruin of Bengal. With a French beauty, a Portuguese Pirate, and a Bengali dancer as his allies, Shayista must find a way to save his Enlightened Empire from his enemies - and to keep the Dark Diamond out of the hands of a diabolical Pir who wants nothing more than to bring Bengal into darkness once again. I started reading this book quite a long while ago, and for some reason I couldn’t quite get into it. I finally picked it up again yesterday, and then proceeded to devour it in just one sitting! 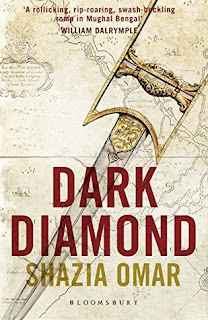 Dark Diamond is filled with romance, tragedy, greed, pirates, magic and is an adventure you’ll never forget. Mughal India, the late 1600’s. The British East India Company is making its first footholds in India, establishing trade and forming relationships, waiting patiently to take over. Lord Shayista Khan rules Bengal not with his heard, but with fear. A rumoured Wizard who does not age, a supposed brutish and uncaring man, he is also in possession of the rarest diamond from the mines of Kollur – the Kalinoor; the Dark Diamond. Inside, Lord Shayista Khan is Talib, a man who has suffered the tragedy of living when all those he loves have died; died because he wasn’t enough to save them. Champa was never one to settle down and marry like custom, and her father, dictates she should. She spends her time helping her grandfather, the local Pir (a Mughal magician and healer) and teaching the young girls in her locality dance and music among other things. Her grandfather’s life work has been searching for the diamond Shayista has hidden somewhere. Madeline, a French Fugitive, is on a mission to find the diamond mines of Kollur to barter for social standing and a rich enough husband. She enlists the help of a pirate to take her to Bengal. In the quest for the possession of the rarest diamond on the world, we are transported into the minds of very different people, learning what makes them tick, their fears and sources of greatest joy. In the search of a cursed object, we see Bengal, and India, in its finest – luxury, culture and trade at its pinnacle, along with the death, closed mindedness and damnation. The only thing about this novel that I didn’t like was a certain someone being alive after all at the ending. It seemed unrealistic, too unreal in a real novel and I wish it hadn’t happened. Dark Diamond is unlike any adventure you’ve ever experienced before, so buckle in and get ready to fall in love. Shazia Omar is a Bangladeshi novelist. Her debut novel, Like a Diamond in the Sky was published by Penguin India and Zubaan in 2009. She studied at Dartmouth College and the London School of Economics. She currently lives in Bangladesh. What is your favourite adventure novel? 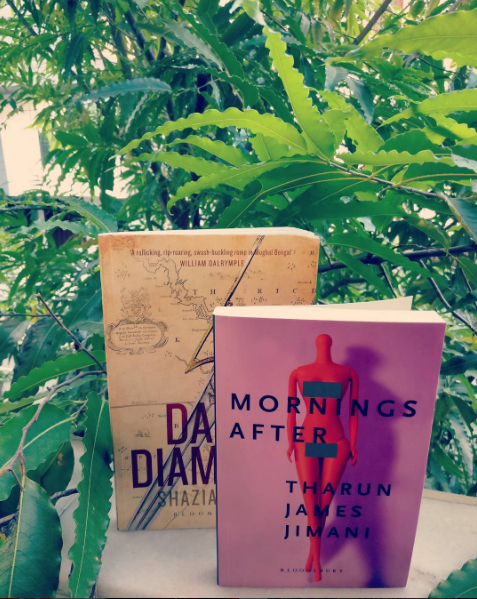 Have you read any adventure novels based in India? What do you think of a cursed black diamond?